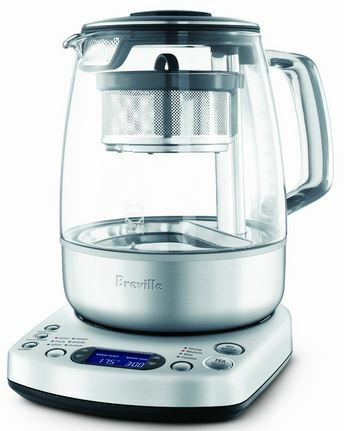 Breville One Touch is reserved for the refined tea brewer. Its versatility and practicality will make it one of the coolest machine in the modern kitchen. This tool is reserved for the refined tea brewer. The ones who are not satisfied with anything a waiter throws at them when ordering a cup of tea and rather drink water than crappy tea. This is for those tea lovers who make their guests longing for the emergency exit when they just ask for “a tea”. There is no such thing as just “a tea”. 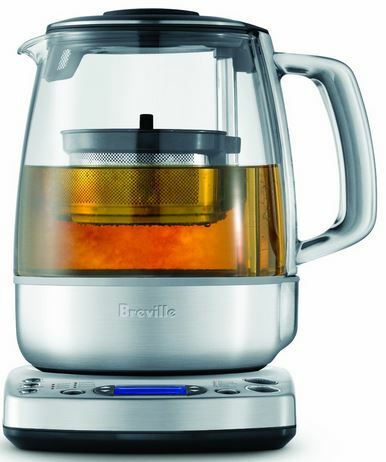 This was the main idea behind creating the Breville BTM800XL One-Touch tea maker. Its versatility and practicality makes it one of the coolest machine in the kitchen. It has to look cool for the price they ask for it, anyway. After all we are talking about an electric kettle what we can get for $20 on Amazon. Also, we wouldn’t like to shun away from mentioning its problems. When ywe pop over to Amazon and read the reviews, you can quickly see the problems the state-of-the-art tea maker faces. As it is expected the mechanics of some units couldn’t cope with the struggle of the real life and break down. This wouldn’t be a biggie if the customer service could solve the issues a bit better but they are rather sluggish. We hope they improve on this, soon. Some people also express concerns about rust like residues and floating particles around which are mostly leftover tea and hard water pieces. These can be annoying as it ruins the awesome looking glass carafe but are considered normal. A special cleaning product can be purchased to get rid of them if you aren’t into scrubbing it off manually. It’s worth to mention that it shouldn’t be submerged into water ever. Although it is an all glass and metal tea maker it has some plastic parts on which the basket moves up and down in the water. Naturally it is a BPA-free plastic but if plastics are a concern to you then this product won’t make you happy ever. Luckily, none of the issues are widespread on any scale. Nothing proves it better than it is still maintaining an almost 5 star rating from plenty of happy tea loving people. 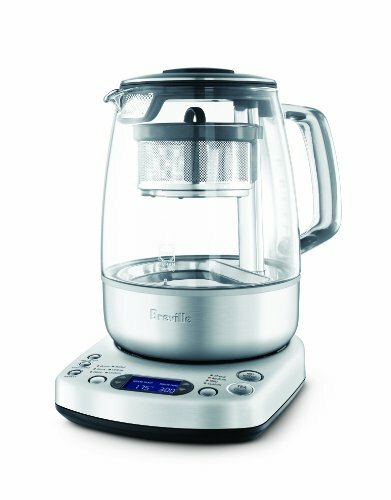 The difference between a cheap kettle and the Breville tea maker lies exactly where the difference is between a bag of Tetley form Target and the Jin Jun Mei. There is also this awesome basket cycle feature that continuously auto lifts and lowers the Basket during the tea brewing cycle. This movement loosens the tea leaves within the Basket, allowing the heated water to circulate freely around the tea leaves for maximum infusion. The keep warm feature doesn’t really worth any mentioning as it can be found on even the cheapest tea makers so it’s not like an innovation of some sort but rather a basic function of a tea maker. It keeps the tea warm at around 70°C – 80°C depending of the brewing temperature for an hour. The function that still worth to mention is the auto start. This feature allows us to program the specific time when the Tea Maker will automatically turn on and start either a tea brewing cycle or water heating cycle. What else one could dream of in a cold morning afterall? These features and buttons are all cool and dandy but how do they judge throwing out a whole bucket of cash? After all getting a neat little kettle which looks cool and cost the fraction of this does the job as well. And anyway, having a great tea is all about having a ritual isn’t it? Well, that may be true. But if we are a busy person who can’t spare a half an hour daily for the tea rituals and still want to have a good cup of tea then we have little other options to choose from. Surely, we can train our housekeeper to make the tea ready when we arrive from the morning jog. But this sounds rather an enormously impossible task comparing to just pressing a couple of buttons and having something exactly the way we like it. Wow this thing looks unreal!